Home > Deals, Games	> Kindle App Weekly Deal! Jewels (A Game for Kindle) is $0.99! Kindle App Weekly Deal! Jewels (A Game for Kindle) is $0.99! ‘Jewels (Weekly Deal! A Game for Kindle)‘ by by Mobigloo is available on the Amazon Kindle site for $0.99 only. Just click here to download and save $1.00! 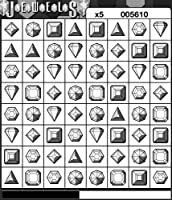 Jewels is a matching game which will put your planning and pattern recognition skills to the test. The rules of Jewels are simple: you swap adjacent jewels (horizontally or vertically) to create combinations of three or more jewels of the same type. Once matched, the jewels are removed and the remaining jewels above it slide down to take their place. The challenge comes when there are few potential matches to find, and you must pick your next move carefully or risk eliminating remaining matches when the jewels shift down. Consider playing the timed mode where you race against a relentlessly decreasing timer and each successful match adds just a bit of time back to the clock. If you cannot find a match, use the Hint feature to show you the next move. The game keeps track of your ten best scores for both Easy and Timed modes, so you can see just how much the pressure of the timer affects your performance! If planning and pattern matching appeal to you, then you will love Jewels!